This is my second interpretation of Gelidonya Lighthouse from a different viewpoint and using a different palette. 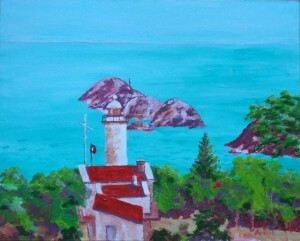 This entry was posted in Fethiye, Living in Turkey and tagged Acrylics, Art, Gelidonya Lighthouse, my paintings on April 29, 2013 by Tony Taylor. Fethiye? Still crazy after all these years! Sabrina on Fethiye? Still crazy after all these years! sareh on Fethiye? Still crazy after all these years! The Top 25 UK Arts & Culture Blogs.